Arsenal in the 30s – February 1935. Despite one slip, Arsenal remain top. At the end of January 1935 the league positions had swung around once more with Arsenal winning all three league games, and now taking a two point lead (and superior goal difference) at the top of the table. But before the football could get underway, on 1 February 1935: Bobby Davidson signed. Davidson had played against Arsenal in the friendly at Muirton in September 1934 and was selected for the Scottish League team against the Irish League a few weeks later. Arsenal offered £4,000 and on 1st February 1935 he moved to Arsenal from St Johnstone. Just 5 feet 3 inches tall it was said he had a kick like a mule, and was in constant trouble with the refs. He went on to play 63 league games for Arsenal – and we’ll see below, he didn’t have long to wait for the first of them. On the pitch Arsenal had just won five in a row (three in the league and two in the cup) and the club continued with this form at the start of February, with an emphatic 4-1 win over fifth placed Sheffield Wednesday. Crayston came back at right half and the left footed Bastin continued at inside right, meaning that the right footed Beasley continued at outside left. James returned replacing Dougall. The line up raised a lot of comment, but it worked. James got a hattrick and Bastin the other, and you can’t argue with results. Meanwhile Tottenham lost 1-0 to Villa – a result which left them in 20th, just one place above relegation. Their slide had been dramatic with just one win in 11 games. On 6 February England played Ireland and won 2-1. Both England goals were scored by Bastin. Next for Arsenal was an away trip to Birmingham on 9 February, and before the game such a venture no longer held deep fears that it would have done at the end of 1934. As a result Allison used exactly the same line up as had been so effective in the game against Wednesday. Birmingham had won seven and lost six of their home games thus far, making them far from invincible at St Andrews, and had just had a run of five defeats, followed by three draws, followed by another defeat in the league. But on 6 February this run had come to an end with a 4-2 home win over Middlesbrough, although still leaving the club 19th in the league. No one expected anything other than an Arsenal win, and yet amazingly Birmingham came out on top beating Arsenal 3-0. The reason was that both Hulme and James were injured during the match, but it was Hulme’s injury that caused the defeat. He left the pitch, leaving Arsenal with ten men, and indeed he didn’t play again until the following October. Before Arsenal could play another game, on 13 February 1935 the death of Phil Kelso was announced, although the club did not acknowledge the fact. Kelso was the manager who took Arsenal to its first two FA Cup semi-finals in 1906 and 1907 and revealed for the first time the real potential Woolwich Arsenal had. He kept the club in the first division after their promotion in 1904, but in 1908 chose to move to Fulham and managed to keep them in the Second Division (avoiding the drop back into the Southern League) throughout his years in the club. Back in 1935, despite the Birmingham defeat Arsenal were still top, as they moved into the next round of the FA Cup, with an away fixture at Reading on 16 February. Reading spent the season challenging for promotion to the second division but eventually lost out to Charlton. In the Cup they had not played any of the top teams on their way through from the first round to the fourth beating, Cardiff, Wrexham, Aldershot and Millwall en route to the most attractive tie they could imagine. For this game Birkett took over from Hulme, and following the Birmingham defeat there was much anticipation of a possible upset. Indeed the crowd of over 30,000 was itself over three times the home team’s average league crowd. Arsenal however saw the game through winning 1-0 with a goal from Bastin. Despite their lowly position in the league Tottenham had also survived this far in the FA Cup, but now went out to Bolton after two drawn games. Of the top teams only Sunderland had a league match to play, and they had a goalless draw away to Middlesbrough. The next round of games came the following Wednesday (20 February)with Arsenal at home to Stoke who had topped the table briefly earlier in the season, but were now lying fourth. Arsenal won 2-0 to stay top. For Stoke it turned out to be the start of a run of five consecutive defeats and only one win in ten which saw them drop to 14th place in the league. The run only ended on 20 April when they beat Tottenham 4-1 to secure Tottenham’s position at the bottom of the league. Now Allison really did ring the changes, not least to give relief to some of his battered team. Sidey, Birkett, Dougall and Davidson came in – the latter for his first game. In this his first match he scored one of the goals (Hill got the other) in a 2-0 victory. As a result he continued to hold his place for the majority of games in the rest of the season, making a total of 11 appearances in all, scoring a total of two goals. The final game of the month was on 23 February – an away game at Manchester City who by now were third, three points behind Arsenal with a game in hand and an impressive home form of 10 wins, three draws and one defeat. Arsenal’s away form had picked up a little in January, but it was still only three wins, six draws and five defeats. Everyone knew there would be a big crowd but the total of nearly 80,000 was still a surprise, being over double City’s average for the season. Allison shuffled the pack once more as John, Roberts and Bowden returned – the latter getting the goal. All in all the 1-1 draw was a fairly satisfactory conclusion. At the same time Sunderland drew 1-1 away to Tottenham, while Sheffield Wednesday beat Leeds 1-0. That was the end of football for the month, but there is one other event I would like to mention, for away from football, and indeed away from any publicity, three days after the Man City game a small group of scientists and government experts gathered in a field in Northamptonshire, not far from Daventry, where Robert Watson-Watt gave the first successful demonstration of radar. He had tried several times before to get the system to work and with his development cash almost gone, this was his final attempt. The successful application of the invention (in front of a largely disbelieving collection of ministers and civil servants) was one of the most important elements in the British ability to defeat the much larger German airforce in the second world war. Without radar, things would have been very different. As for the football, the league table is given below, and this time I include the full table – just so we can see what had happened to Tottenham (who were Arsenal’s next opponents on March 6). There were 12 games to go and Arsenal as can be seen had a two point lead and a far superior goal difference. They just had to keep chugging along to secure their third title in a row.. Also, if they continued to score over one goal a game they would surely reach the magical 100 goal mark for the season. As for Tottenham, they needed to start winning, and start winning quickly. Here is, as always, the summary of the games of the month. *This average is for league games and thus not directly comparable with an FA Cup match. AC is the average crowd for the home team through the season, providing a comparison between the crowd on that day (in the previous column) and the norm expected by the home side. 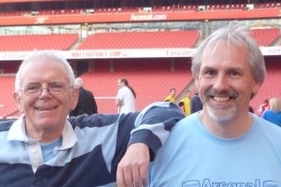 The Arsenal History Society website is based around series of articles on specific themes – and you can find links to many of these on this page and on the left column under the heading “Pages”. Here are some of the more popular series that have been written recently or are actively being updated at the moment. Arsenal in the summer – now over 50 articles. 2 comments to Arsenal in the 30s – February 1935. Despite one slip, Arsenal remain top. In this week when Mesut Ozil scored his first ever hat trick it is interesting to note Alex James’s hat trick mentioned above was his first and only of his first class career also. There are several stories behind this fact and I quote from the book ‘Alex James Life of a Football Legend’ by John Harding pages 172-3. To combat James, even though he was now at the veteran stage of his career, was still a nightmare for the opposition: whichever way the tactics were shaped, they seemed to backfire. Yet, in the middle of the triple championship season, 1934/35, that most unlikely of things happened: on 2 February at Highbury against Sheffield Wednesday James scored that hat trick. How he managed it-or rather ,why,- is part of Highbury folklore and typical of the furore that surrounded just about everything that he did. Wednesday’s manager , Billy Walker, is supposed to have told his players not to mark James near the Wednesday area because ‘he never scores these days’. Another version of the story current for many years gave his son the credit for having goaded his father by coming home on the morning of the match after scoring seven goals in a school match ,and wondering why he, the great Alex James, never did the same. Two years after the event , however, James provided a clue as to his frame of mind that afternoon. He recalled that the day before the game , manager Allison had signed Bobby Davidson from St Johnstone, a stocky little inside forward whom Allison declared, rather oddly to have ,’a big sweeping mind and feet to respond to it’. He was apparently, the ‘new Alex James’. [This James declared, was a ‘wicked untruth’. ]…It was a rotten yarn but it stuck and, incredibly enough , even some of the Arsenal players believed it. In fact , I’m not at all sure that even Bobby himself did not think there was something in it. Hope you enjoyed this piece as I thought it quite a coincidence that Ozil should accomplish this feat on the same day as Tony posted. Lets hope Mesut Ozil can go on and achieve the greatness for us that Alex James did. Yes, thanks very much for supplying it, and as you say, a great coincidence.